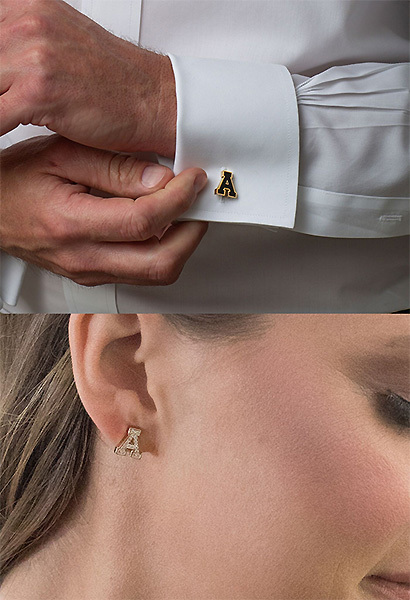 Join our email list below and be entered to win your choice of Officially Licensed Appalachian State Diamond Earrings (retail value $890) or 14k Gold and Black Onyx Cuff Links (retail value $945). THIS PROMOTION HAS ENDED. No purchase necessary to enter or win. One entry per person; multiple entries from the same person will be disqualified. Contest ends 6 February 2019 at 11:59pm EST; winner will be selected at random by software, and verified by Brindle & Figg or its designated agent, on 7 February 2019. Winner will be notified via the email address provided. If winner fails to claim prize within 14 days of being notified, Brindle & Figg reserves the right to withdraw prize and randomly select a replacement winner.